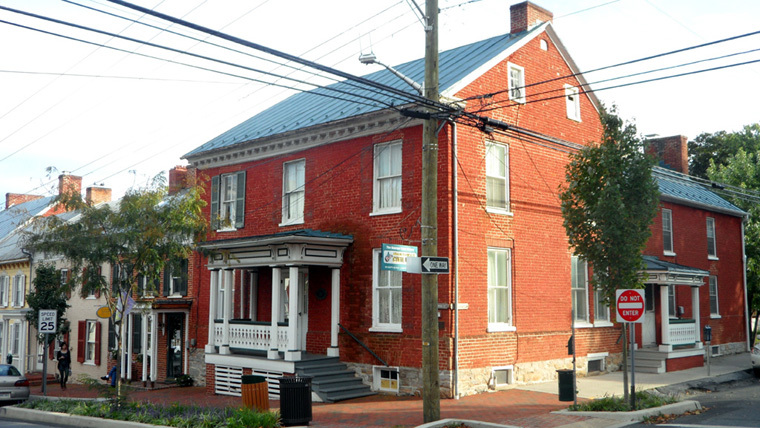 CONRAD SHINDLER, a Shepherdstown coppersmith, built this house on the southeast corner of German and Church Streets in 1795. The house served as his family residence as well as his workshop, which was located in the basement. After Shindler’s death, the family sold the property in 1869 to the Christ Reformed Church, which used the house as its parsonage. In 1995 actress Mary Tyler Moore, a direct Shindler descendant, purchased the property and deeded it to the Shepherd College Foundation in honor of her father. It now houses the George Tyler Moore Center for the Study of the Civil War. Shindler House, later the Reformed Parsonage. Now the George Tyler Moore Center for the Study of the Civil War.